Some gun stand out when I am testing them. They look right, they feel right, and, most importantly, they shoot well. They achieve aesthetic harmony and get top marks for 'usability' too. It is amazing how many guns just do not meet the basic criteria (i.e. that they should look reasonable, feel comfortable, point and swing well, don’t recoil too much, and have controls which are easy to operate). It also odd just how many people struggle on with gun which are not helping them at all! Gun design is a complex subject, but it is not rocket science. I often get the impression that manufacturers have too many committees/design teams and not enough individual input from people who actually use their products. When putting guns through their paces, one notices a a number of ‘should-not-be-there’ problems concerning stock shapes, barrel regulation and excessive vibration on firing (often, I suspect, a product of designs which employ a stock bolt rather than a traditional vertical breech pin which fixes the stock between top and bottom straps). It is not a case of new is bad, old is good, however. The top-flight craftsmanship of a century ago was impeccable – frankly, better than today in most cases. BUT, the guns did not always shoot perfectly. Far from it. Notwithstanding my previous comments on regulation and vibration, and matters of finish apart, many modern guns are better than older ones (especially at the lower end of the market). Over and unders, the dominant modern type, are, all easier to shoot than side by sides (unless you were brought up on a side by side). They tend to be more reliable (if mass produced) and are, arguably, safer (because the barrels are typically stronger). A notable change is that computer controlled machining has improved the quality of all grades of gun. I would note some issues. I don’t think much of modern stock shapes – machine made butts tend to be too ‘clubby’ often with poor grip and comb shapes. Many of the old subtleties seem to have been lost as a result of robo production. When a craftsman runs his hand, or casts his experienced eye, over wood or metal he picks up things no machine can. Barrels tend to be weighty today (usually because they are multi-choked and made a little thicker than might otherwise be the case by litigation fearful manufacturers). Trigger pulls are not, generally, as well adjusted as they should be. Nor can one assume straight barrels (in fact, they are the exception), or, ones which shoot to the same point of aim at 40 yards. Machines, moreover, can do too much on best quality guns – a gun which has a hand filed action and barrels struck up by hand always seems to have an extra quality to it. With regard to the action, this is predominantly an aesthetic issue, but handmade barrels allow for lighter, thinner-walled, tubes too. These can be a real advantage to the game shot who needs a fast moving, reactive, gun. Many mass-market game guns are spoilt by their heavy barrels and excessively front heavy balance. By chance this heads my alphabetical list, but were I braver, and had the guns been ranked, the Silver Pigeon would still be at the top, or very near the top of the list. It is available in all sorts of grades and has evolved from the old model 55. It is a fantastically good gun by any standard (which is why it holds its value better than just about anything else other that a classic Purdey or Holland in tip-top condition). The Silver Pigeon is notable for a low action profile made possible both by a bifurcated lump design and its clever conical bolts (which also simplify manufacture). I especially like the guns in 30” 20 and 28 bore EELL form, but this is being subjective. They’re nearly all good and you can’t go wrong in advising a friend to buy a Silver Pigeon/686/687 new or old. They are never disgraced in any company, they are known for longevity – approaching indestructibility – and they shoot consistently well. Now, I am not including this just for devilment (well, perhaps, I am). I like semi-automatic guns and think they have been under-rated in Britain (as those who read my recent comments in this magazine some months back will be well aware). The 303 is in my view simply the best semi-automatic ever made. It is gas operated (and thus soft-recoiling) and aesthetically about as good as any repeater can be. Mine, a rare 32” specimen, has digested 200,000 cartridges and I cannot understand why Beretta do not continue to make it. We don’t need bells and whistles for pigeon, wildfowling, or, indeed, clay shooting, just something that works and works and works. The 303 does. The Browning is iconic, it was the last invention of firearms genius, John Moses and perfected in the 1920s (with first commercial sales beginning around 1930). The Superposed was the first successful mass-produced over and under and has been profoundly influential. Unlike the Beretta Silver Pigeon it has a full-width hinge pin, so it is a bit taller in the action. It also has a full width bolt which emerges from the action face to meet a bite beneath the bottom chamber mouth. It’s a very strong design, but the trap door arrangement in the belly of the action makes it quite complex to produce (though it is not especially expensive in its basic grades – on the contrary – it appears to offer exceptional valuye). It is extremely reliable. For game shooting I would go either for a 28” Japanese made gun (most Browning over and unders are made by Miroku in Japan), or, by preference, a 30 or 32” 12 or 20 bore from the custom shop. It would have fixed choke barrels and a semi-pistol grip. The Browning action design suits a 20 bore especially well. I might note that Mirokus offer similar guns at most competitive prices. The hand-finished Grade V Miroku MK38 gets my vote as the most gun for the least dosh. The 32” version is a great tool for high birds. The makers of ‘best guns only’ have to be included high on this list. I have not found Boss over and unders particularly easy to shoot – they are often made lighter than my preference and without top rib – but no gun save Messr’s Anson and Deeley’s boxlock and the Purdey-Beesley sidelock has been more influential. Beretta copied a Boss in the early 1930’s before they started to mass produce over and unders. The Perazzi and Kemen action owe much to Boss (and Woodward). Boss also perfected single triggers and did much to make the over and under a respectable form of gun (later aided by Woodward and Browning). The workmanship on any Boss is outstanding. Their shapes (such as their forend) are wonderful. My favourite Boss guns are their round-action side by sides. These tick all my boxes. They are beautiful to look at, and, fabulous to shoot. Many who try to copy the firm’s round-bar side by side just don’t get it quite right. My choice would be a 30” single trigger 12 with classic Boss engraving. The Guerini gun is a product of the Italian CNC revolution. I use a 32” 20 bore Maxum game gun for most of my game shooting (as well as, on occasion, a 30” Beretta EELL 28 bore and a Thomas Turner lightweight side by side for walking-up). I think you would be hard pressed to find a better looking gun for less money than the Maxum (which has deep scroll engraving on its sideplates). More to the point, I have never shot anything as well at driven birds. It breaks the rules. It weighs in at 7lbs. 3oz and is front heavy but it works. I like the semi-pistol grip stock. The mechanical design is well proven with elements of Beretta and Browning. The latest guns offer solid, tapered, ribs and Boss-style forends (funny how that name keeps coming up). 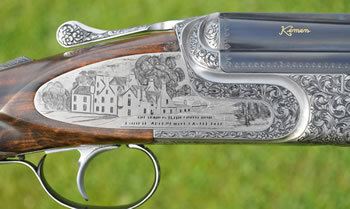 You can get up-market versions and William Evans base their elegant St. James model on 20 and 12 bore Guerinis brought to the UK in the white with classic Evans style engraving upon them (copied from an old gun of the Duke of Connaught). They all shoot well and look very good. If in doubt go for a 30” 20 bore. I don’t think there is any gun in the world that I would rather own than a bespoke Royal side by side. I like the elegant way they look, and I love the way they shoot. They suit me. Their action has been more copied than any other sidelock because it is simply a combination of all the best ideas of the English trade in one gun. It is nearly always built with Southgate pattern ejector work which has the reputation as being the most reliable of all too. The thing that really gets me going concerning the Royal, apart from the wonderful build quality and balance, is the effort that goes into regulation. H&H are one of the few firms left that not only have their own shooting ground, but have one man whose only job in life is to regulate guns and make sure everyone shoots perfectly. I have never shot a modern Holland that did not shoot well (and I have shot at least a dozen of their new guns). They maintain old world standards, have a massive pool of expertise, and continue to make consistently great guns. My choice would be a 30” single trigger Royal with detachable locks, classic deep-scroll engraving, and a coin finished action. In 20 bore form, this is another of my all-time favourites. The cost is very considerable, but, if money were no object I would have to have one (or, a pair). It is a delightful, precise, tool with great pointing qualities, perfect trigger pulls and lovely action and stock shapes. There are more gaudily decorated guns out there, but none that shoot better than this little over and under. My dilemma would be whether to go for 30” or 32” barrels. Probably 30s because I know they work (guns are singular things, don’t assume that because one barrel length works on one gun that it will work on another). I have always liked the Kemen KM4 which is a Perazzi inspired detachable trigger-lock gun with rather different handling qualities than the original (and one or two mechanical changes in the trigger mechanism – notably the means of removing it). The big difference between a Kemen and Perazzi concerns the handling. Kemen guns – and many are 32” barrelled – are long and relatively light with stock shapes that are more sporting than a Perazzi. Kemens seem to work best with barrels weighing around 1570 grams. Recently, though, I tried the new, hugely expensive (50K) titanium model. It was, I think the best over and under that I have yet shot. It’s all up weight was 7 ½ pounds, it’s perfectly regulated 32” barrels weighed 1550 grams (sorry to mix systems, but, its the way most of us in the gun trade conceive of these specifications) and were choked about 25 thou top and bottom (between half and three-quaters). I want one! The Perazzi gun has an extraordinary pedigree, including a tally of Olympic gold medals. The famous MX8 model was created by Daniel Perazzi and Ivo Fabbri (another gunmaking genius) for the use of Ennio Mattarelli who had won a gold medal at trap in the Tokyo Olympics of 1964 and who had great expectations for Mexico in ’68 (dashed by our great Olympian, Bob Braithwaite). The MX8 and Mattarelli thrived though. I think it is probably the best modern over and under design regardless of price. It offers bifurcated lumps, strong Boss system locking, great trigger pulls, and well made, especially well-regulated barrels. For game shooting, I would probably favour a 32” 20 bore. Those who want to be different might look at John Jefferies HPX concept gun which is available with 34” barrels and special ribs (and weighs in somewhere around the 7 1/2lb mark). Again, I would go for the 20 bore – athough John is at work on a lighter weight 31” 12. That’ll be an interesting beast. There is, of course, a magic to the name. Few who shoot have not aspired to a Purdey at some time or other. The basic action – little changed in 130 years – was the work of Frederick Beesley, its innovation, hammerless design apart, was to use one limb of a V spring to power the hammers and another for the self-opening feature. Ejectors came a little later. I love Purdeys old and new (I kicked myself a while back when I missed the opportunity to acquire an 1880s non-ejector which was probably the most beautiful side by side I had ever encountered – not in a flashy sense, but because its proportions and workmanship were flawless.) The guns continue to be made in London together with Purdey Woodward over and unders and the new Purdey Sporter (which though made in conjunction with Perugini and Visini in Italy is predominantly manufactured in Purdey’s Hammersmith factory). My ideal specification modern Purdey would be a 29 or 30” 20 bore side by side game gun with standard rose and scroll and double triggers. Then again, I might go for the classic 12 with 28” barrels. Westley Richards make all sorts of shotguns and rifles in a factory which must rate as one of the most extraordinary in the gunmaking world (it was purpose built quite recently). Putting rifles out of the matter (and they would be top of the list if I wanted one (with H&H and J.Roberts), my favourite Westley is the detachable lock, box-lock. I shot one for a gun test some while back and it impressed me hugely. Build quality was impeccable. Though relatively light, its felt recoil was low and it’s barrel and trigger regulation near perfect. Westley Richards are very careful in this aspect of production and you can feel and see the difference when you shoot their guns. My ideal spec would be a 30” pigeon ribbed 12 bore gun with a Model C doll’s head, classic Westley top-lever, a semi-pistol grip and single trigger and an all up weight around 7lbs. They offer better value than some makers too.